Figure 4.4. IgGκ immunosubtraction example. The monoclonal protein peak is removed with addition of anti-IgG and -κ antibodies. (This figure was originally published in , reproduced with permission from Taylor & Francis Group). Immunosubtraction can be used in place of IFE for typing the majority of monoclonal protein bands, but it is less sensitive . In this technique, antibodies against IgG, IgA, IgM, κ or λ (bound to solid phase beads) are incubated with serum aliquots, then CZE is performed to determine which reagent(s) remove an electrophoretic abnormality (Figure 4.4). This procedure works well with samples producing discrete monoclonal protein spikes and is easier to perform than sIFE . However, IFE may still be required as a complementary method to determine the monoclonal protein type in a number of situations . These include detection/typing of: 1) monoclonal sFLCs of the same type as the characterised monoclonal intact immunoglobulin; 2) multiple monoclonal proteins, e.g. biclonal gammopathies or oligoclonal banding; 3) “hidden” monoclonal proteins, e.g. 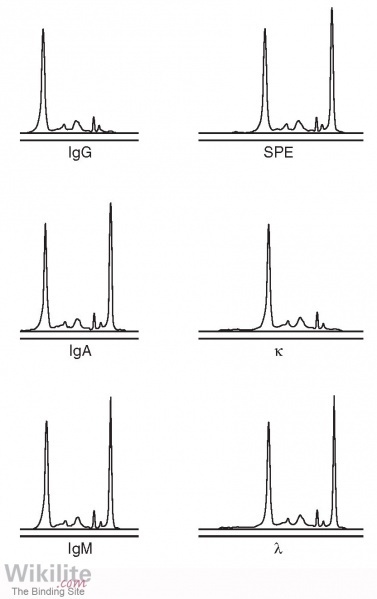 small (<3 g/L) IgA or IgM monoclonal proteins that co-migrate with other serum proteins in the β-region; and 4) IgD and IgE monoclonal proteins.